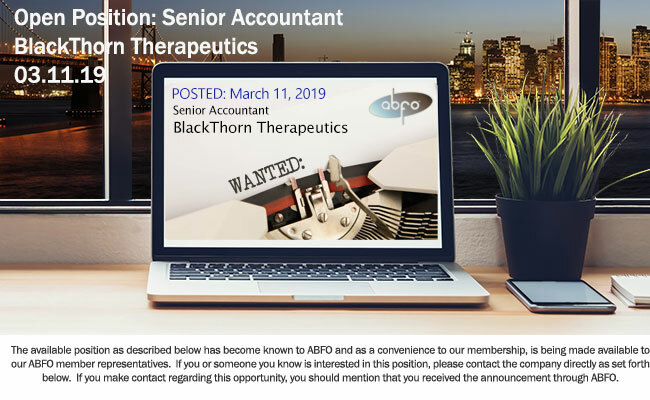 The Senior Accountant will serve as a key member of BlackThorn Therapeutic, Inc.’s (“BTRX”) Finance function. Reporting to the Senior Manager, Accounting, the role will be responsible for assisting with month-end close, ensuring compliance with US GAAP, payroll operations, and assisting in the implementation of internal controls. Manage compliance calendar and primary preparer of local, state and federal compliance filings. Serve as subject matter expert for regulatory filings. Assist with month-end financial statement variance analysis, which includes comparing budgeted or forecasted results to actual results for BTRX programs and departments. Research and provide recommendations on best practices for internal control processes and policies. In partnership with Senior Manager, Accounting, develop and maintain accounting procedure manual. Ensure that vendor bills and payments are processed timely, accurately, and in accordance with company policies and procedures. Biotech, software, or healthcare industry experience is highly desired. SOX 404 experience is highly desired. Strong interpersonal communication skills required.